A NEW PRODUCT KIT WE HAVE BEEN DEVELOPING AT OUR NEW STORE FOR WELL OVER ONE YEAR. 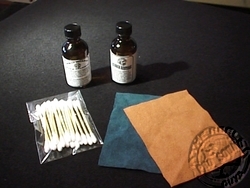 WE ARE VERY EXCITED OVER THE RESULTS OF OUR MANY TESTS WITH THE EXACT TWO CLEANERS AND RUBBER RESTORATION YOU WILL RECEIVE IN THIS KIT. YOUR KIT COMES WITH A FULL SATISFACTION GUARANTEE, IF IT DOES NOT LIVE UP TO AND EXCEED OUR DESCRIBED RESULTS ON YOUR DECK'S DIRTY OR OXIDIZED RUBBER PINCH ROLLERS, BELTS AND REEL HOLD DOWNS. PLEASE SEND THE UNUSED PORTION BACK TO US AND WE BUY IT BACK FROM YOU FOR YOUR PURCHASED PRICE. THIS KIT CAN, AND WILL IN MOST CASES, PAY FOR IT'S SELF WITH JUST ONE USE ON YOUR DECKS MAIN CAPSTAN BELT, PINCH ROLLER OR RUBBER REEL HOLD DOWNS SEPARATELY. THIS KIT IS A MUST HAVE FOR ALL THE SINGLE VINTAGE REEL TO REEL DECK OWNERS, AND THE MULTI-DECK COLLECTORS, RIGHT DOWN TO ALL YOU GOOD FOLKS OUT THERE SPENDING THE MANY HOURS REPAIRING AND REFURBISHING THESE WONDERFUL WORKS OF ENGINEERING ART FOR RESALE. THE MOST FANTASTIC THING ABOUT THIS RUBBER REJUVENATION KIT IS SOMETHING MONEY CAN'T BUY, YOUR TIME AND FRUSTRATION! IF YOUR DECK'S MAIN CAPSTAN BELT IS SLIPPING, CAUSING YOUR DECK'S "WOW" TO GO IN AND OUT, WHAT DO YOU DO? YOU MAY FIRST GO ON LINE AND HOPEFULLY EMAIL US FOR A REPLACEMENT BELT FOR YOUR DECK. A BELT REPLACEMENT WILL COST YOU FROM $15.95, ALL THE WAY TO $19.95. WHEN THE BELT COMES IN YOU THEN HAVE TO FIGURE OUT HOW TO REPLACE YOUR BELT. IF YOU HAVEN'T PREFORMED THIS TASK BEFORE ON YOUR OWN DECK, YOU MIGHT NEED TO PURCHASE A SERVICE MANUAL THAT WILL SHOW THE COMPONENTS YOU MUST TEAR DOWN. THERE GOES ANOTHER 15 TO 25 BUCKS, BUT THAT'S NOTHING TO WHATS AHEAD OF YOU NEXT. FOR A FIRST TIMER TO REPLACE A DECK BELT IT IS NO EXAGGERATION TO STATE IT WILL TAKE 2 TO 4 HOURS MINIMUM. WHAT IF YOU COULD JUST REMOVE YOUR DECKS BACK PANEL AND IN AN EASY TWO PART PROCESS, CLEAN AND REJUVENATE THAT SLIPPING BELT, SNAPPING IT BACK, VERY CLOSE TO NEW. WE OFFER AN ALTERNATIVE THAT WILL TAKE APPROXIMATELY 20 MIN. TO 1 HOUR, WITHOUT EVER HAVING TO REMOVE THE BELT. WE HAVE APPLIED THIS PROCESS TO OVER 50 DIFFERENT DECK MODELS IN OUR STORE, FOR OVER ONE YEAR OF TESTING. IN WELL OVER 90% OF OUR TEST CASES, WHERE THE BELT WAS INTACT AND DRIVING THE CAPSTAN FLYWHEEL FROM SLIPPING TO COMPLETELY NOT TURNING, THIS PROCESS PREFORMED FLAWLESSLY. OUR PROCESS MADE OUR TEST BELTS GRIP AND BECOME SUPPLE AGAIN. USING THE KIT'S COTTON SWABS, DIP ONE END INTO THE PRE-CLEANER. APPLY CLEANER AND WORK INTO THE EXPOSED PORTION OF THE BELT THAT IS NOT ENGAGED TO THE FLYWHEEL OR OVER THE CAPSTAN MOTOR PULLEY. USE THE DRY END OF THE SWAB TO DRY AND PULL OFF ANY RESIDUAL DEBRIS STILL ON ALL FOUR SIDES OF THE BELT. ONCE THE CLEANER IS DRY REPEAT THE SAME PROCESS WITH A NEW SWAB AND THE RUBBER RESTORE. USING THE DRY END, SWAB UNTIL YOU NO LONGER SEE ANY RESIDUAL DEBRIS OR BROWN SUBSTANCE COMING OFF THE BELT AND ONTO THE SWAB. NEXT YOU WILL REPOSITION YOUR BELT, USING THE CAPSTAN SHAFT OR CAPSTAN MOTOR FAN ON THE REAR OF THE MOTOR TO EXPOSE ANOTHER AREA. REPEAT THE ABOVE PROCESS UNTIL THE ENTIRE BELT HAS BEEN CLEANED AND REJUVENATED. WE HAVE PREFORMED THIS "ON DECK" BELT RESTORE PROCESS ON EVERY BRAND AND MODEL OF DECK THAT HAS COME THRU OUR STORE OVER THE PAST YEAR WITH OUR TECH DEPARTMENT. WE WERE ABLE TO RESURRECT 90% OF THE INTACT BELTS WE CAME ACROSS IN THESE DECKS. THIS KIT WILL NOT REFURBISH BELTS THAT ARE STICKY LIKE TAR TO THE TOUCH OR HAVE CRACKS. PLEASE NOTE THIS WHEN YOU ARE INSPECTING YOU PRESENT DECK'S BELT. THIS PRODUCT WILL NOT, LET US REPEAT, WILL NOT, RESTORE YOUR DECK'S ORIGINAL FACTORY CAPSTAN PINCH ROLLERS OR ORIGINAL FACTORY MANUFACTURED BELTS THAT CAME WITH YOUR DECK NEW. IF, LIKE IN MOST CASES ON YOUR DECK, THEY ARE BECOMING GUMMY AND STICKY, ONLY NEW REPLACEMENT PARTS WITH CURRENT MANUFACTURED RUBBER COMPOSITIONS WILL SOLVE YOUR PROBLEM. IF YOU ARE CERTAIN YOUR PINCH ROLLERS AND BELT ARE SOMEWHAT CURRENT REPLACEMENTS AND NOT THE ORIGINALS, THEN THIS PRODUCTS WILL PERFORM AS DESCRIBED ON YOUR DECK. 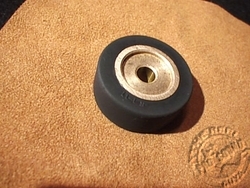 LET'S TELL YOU ABOUT ANOTHER EVEN MORE RARE AND EXPENSIVE RUBBER REPLACEMENT PART ON YOUR DECK. A DAY DOES NOT GO BY AT OUR STORE WHEN WE DO NOT GET 2-3 EMAIL OR PHONE CALL REQUEST FOR REPLACEMENT PINCH ROLLERS THAT WE ARE EITHER SOLD OUT OF OUR STOCK OR ARE SO RARE WE CAN NO LONGER LOCATE THEM TO SELL NEW. IN OUR RESEARCH DURING THESE CORRESPONDENCES WE HAVE DETERMINED THAT AT LEAST 60% OF THESE REQUESTS ARE TO REPLACE A PRESENT PINCH ROLLER THAT OUR KIT COULD MAKE LIKE BRAND NEW WITHOUT REPLACING THE ROLLER. THE PROCESS TO CLEAN AND REJUVENATE PINCH ROLLERS TAKES JUST 10 MIN. WE PROMISE THAT THIS PROCESS WILL BRING A SMILE TO YOUR FACE IF NOT POP YOUR EYES OUT WHEN YOU SEE AND FEEL THE DIFFERENCE OF YOUR PINCH ROLLER BEFORE THEN AFTER. JUST ONE COTTON SWAB TIP DIPPED INTO OUR PRE-CLEANER AND APPLY THE CLEANER OVER THE ENTIRE ROLLER, WORK IT IN, THEN DRY. NEXT TAKE ONE SWAB TIP DIPPED INTO OUR RUBBER RESTORE BOTTLE AND WORK IT IN, THEN DRY. FINISH OFF WITH RUBBING THE ROLLERS OUTER CIRCUMFERENCE ON OUR SPECIAL, KIT PROVIDED, CHAMOIS CLOTH AND YOU HAVE A PINCH ROLLER THAT LOOKS AND PERFORMS LIKE BRAND NEW IN 95% OF OUR TEST DECKS. IF YOUR PINCH ROLLER HAS WHAT'S CALLED "CAPSTAN BURN", THAT IS WHERE YOUR PINCH ROLLER HAS ROUNDED DEBITS ACROSS THE OUTER FACE. THIS WAS CAUSED DURING YOUR DECK'S LIFE, WHEN EITHER YOUR TAPE TRANSPORT MECHANISM OR YOUR PINCH ROLLER ITSELF FROZE WHILE YOUR PINCH ROLLER WAS ENGAGED AND YOUR CAPSTAN WAS STILL SPINNING FOR ANY LENGTH OF TIME. THUS YOUR CAPSTAN SHAFT BURNED OR RUBBED A DEBIT INTO YOUR PINCH ROLLER. NEEDLESS TO SAY OUR KIT'S PRODUCTS WILL NOT ALLEVIATE THIS PROBLEM WITH YOUR PINCH ROLLER. IT CAN NOT GROW BACK RUBBER THAT HAS BEEN WORN AWAY. NEXT LET US TELL YOU ABOUT A DECK COMPONENT THAT IS THE RAREST TO REPLACE WITH A NEW ORIGINAL THAT THIS KIT WILL WORK WONDERS ON. 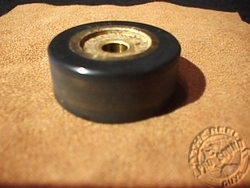 IF YOU HAVE A VINTAGE DECK THAT USES RUBBER REEL HOLD DOWNS THEN YOU KNOW THAT THE 25 YEARS TO 40 YEARS SINCE THEY WERE MANUFACTURED HAS MADE THEM HARD AND IN MOST CASES USELESS TO THERE ORIGINAL PURPOSE. THEY FRUSTRATINGLY FALL RIGHT OFF YOUR DECK'S REEL TABLE SHAFT. THEY HAVE A HARD TIME HOLDING ON THEMSELVES MUCH LESS A SPINNING REEL WITH YOUR DECK IN A VERTICAL POSITION. BY NOT ONLY CLEANING AND REJUVENATING THE OUTSIDE OF THESE RUBBER HOLD DOWNS BUT MOST IMPORTANTLY CLEANING AND REJUVENATING THE HOLE IN THE HOLDERS THAT CAPTURES YOUR REEL TABLE SHAFT, THEY GRIPPED LIKE NEW AGAIN IN 80% OF OUR 50 PAIR TEST WITH THIS KIT. IF THERE ARE NO CRACKS AND THEY ARE JUST STIFF AND OXIDIZED WAIT AND SEE WHAT THIS STUFF WILL DO TO THEM! THAT COVERS THE 3 MAJOR USUAL REPLACEMENT PARTS THIS KIT REJUVENATION WILL MORE THAN PAY FOR IT'S SELF WITH THE FIRST USE ON YOUR DECK. NOW EVEN IF THIS KIT WOULD DO JUST THAT ONE DECK IT STILL WOULD BE A BARGAIN PRICE FOR THE LABOR AND FRUSTRATION TIME IT WOULD ELEVATE. BUT TRY ENOUGH PRE-CLEANER AND RUBBER RESTORE TO DO 100 PLUS DECK'S PINCH ROLLERS, MAIN CAPSTAN BELTS, COUNTER BELTS, REEL HOLD DOWNS IF USED AS WE HAVE DIRECTED AND THAT'S WHAT WE ARE OFFERING WITH THIS KIT. ONE 2oz CLASS BOTTLE OF OUR VERY OWN FORMULA OF RUBBER "PRE-CLEANER"
PLEASE NOTE THAT INCLUDED IN THIS KIT IS ONE 2oz BOTTLE OF "M G CHEMICALS" PRODUCT NAMED "RUBBER RENUE". YOU OF COURSE ARE ABLE TO PURCHASE THIS PRODUCT ALL ON IT'S OWN AT STORES AND ON THE NET. BUT WE MUST ADVISE THAT WE HAVE USED THIS WONDERFUL PRODUCT IN OUR REPAIR FACILITIES BY IT'S SELF FOR YEARS, AND IT IS ADVERTISED AS BOTH A CLEANER AND RUBBER REJUVENATE, BUT WE FOUND THAT ONLY AFTER WE APPLIED OUR PRE-CLEANER PRIOR TO THE APPLICATION OF RUBBER RENUE TREATMENT DID WE GET THE FANTASTIC RESULTS WE SITED ABOVE IN OUR KIT DESCRIPTION. I JUST WANTED TO EXPLAIN TO ALL YOU GOOD FOLKS IN ADVANCE ANY QUESTION YOU MIGHT HAVE AS TO WHAT'S THE DIFFERENCE BETWEEN OUR KIT BEING OFFERED HERE AND JUST BUYING A BOTTLE OF RUBBER RENUE. 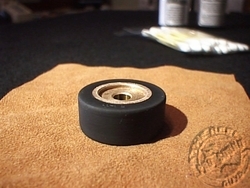 OUR "PRE-CLEANER" ALONG WITH OUR TECH DEPARTMENT CONTRIBUTED TRICK OF THE CHAMOIS TO RUB OUT YOUR PINCH ROLLER ON AFTER THE RENUE PROCESS HAS BEEN DESIGNED AS A KIT TO PROVIDE REEL TO REEL DECK OWNERS A PROCESS THAT WE HAVE HAD REQUEST FROM MANY OF OUR CUSTOMERS TO PROVIDE. THANK YOU!